I am a tiny bit obsessed with dressing my kids. When they were newborns, they primarily wore clothes that we had been given, and since they pooped, puked, or peed through every outfit in half an hour - I wasn't too concerned about what they wore. 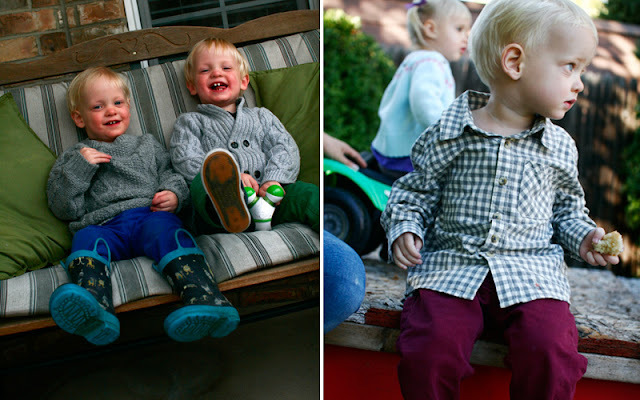 They wore anything with minimal snaps, little footies, and soft fabric. When the boys were like 6 months old, we went to story time at the library and two older twin boys ran by us. They were probably only two, but they seemed gigantic compared to my kids. And they were dressed... Okay, is it weird that I can still picture exactly what those little blond haired cuties were wearing? They were wearing cuffed skinny jeans and tiny brightly colored Toms. They both had big, bulky grey "grandpa sweaters" buttoned and toggled over tshirts. I stared at them and thought, "But that's how I dress. Can you dress kids like that? Do they make awesome clothes that tiny, or did that mom knit those clothes?" It was a serious revelation to me. Which sounds dumb, because who even cares about how their kids are dressed? That's silly. 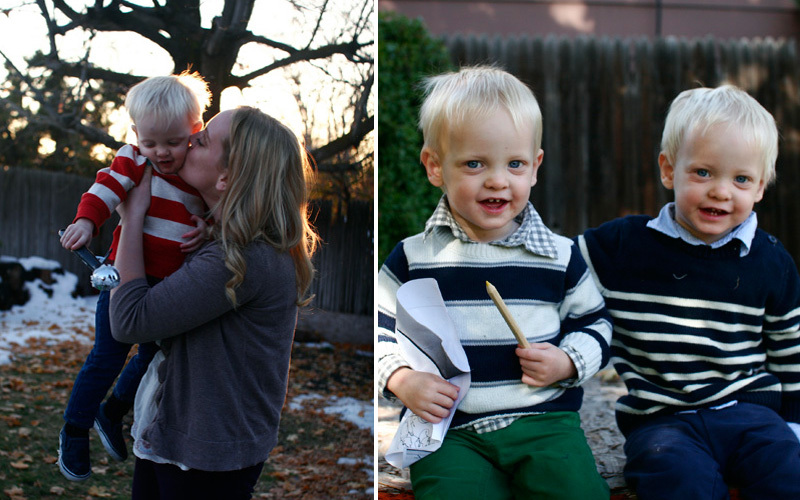 But I looked at those blond little boys and their cute mismatched, yet coordinating outfits and thought, "Those are my children in the future." But it turns out that I'm pretty poor. And those bulky grandpa sweaters cost freaking bank if you're buying two. Even when the baby Gap finally puts things up for sale, they're still $14 a piece and they never have quite the size or style you want. So I learned to shop. I signed up for approximately 100 emails from children's stores. And I made myself promises. Promise One: I will not buy children's clothes that aren't awesome. If I can get two crappy shirts from one store that I hate for the same price as one shirt from Baby Gap that I drool over, I'm getting the one shirt that I love. This sounds stupid, and shallow. I know. But I love beautiful things. Beautiful things make me happy. I don't care about name brands, but it's the same reason that I make an effort to have a pretty home and I like to watch artistic foreign films. It's just prettier. And lovely things are happier. Anyway, Promise Two: I also won't excessively buy things. (This is very hard for me.) I can go without an extensive wardrobe personally, but if I see tiny colored toddler jeans on sale, I want to buy a rainbow. But I only need two pair. Because I only have two children. But this weekend, we went to the outlet mall and got all the winter clothes that were clogging the shelves - being sold off for like $1.50 per sweater to make room for spring. Then H&M, where the same thing was happening. Then Kmart, where kids shoes were like $3 a pair and rainboots were $6. And I have no real point to this post except to say: I got a ton of clothes this week, and I'm really excited. And my kids will dress really cute. I'm delighted by it. I love to pick out their mismatched but coordinating outfits each morning. And luckily, since I buy all their clothes, even when they pick their own clothes (which is starting to happen) they're still wearing stripey tshirts and skinny jeans and cardigans. 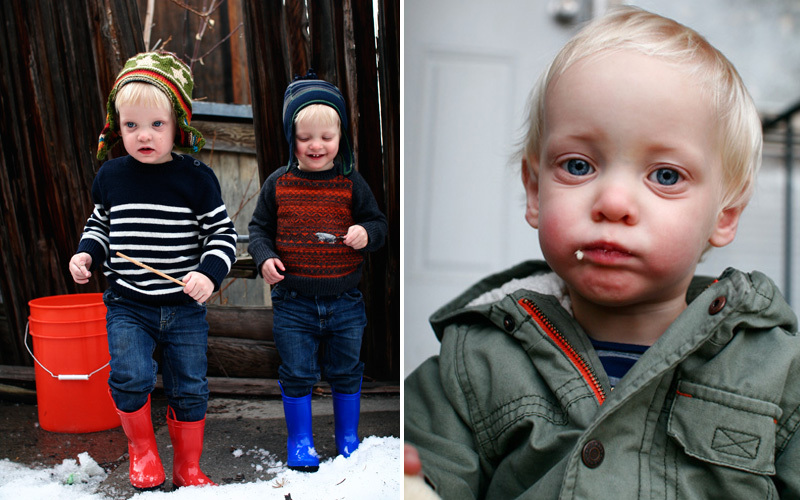 And I'm using this post to share pictures of my kids being adorable and well dressed. 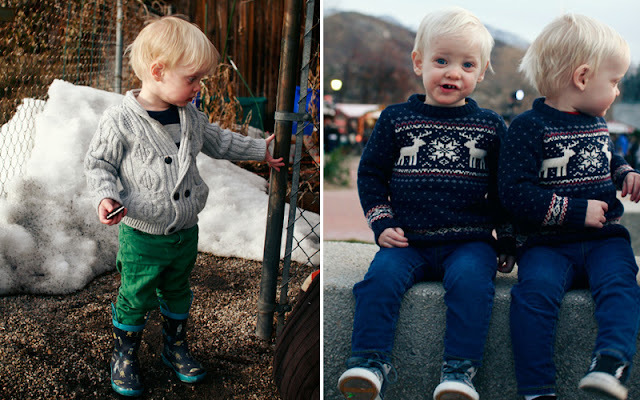 I can't tell you how many times I've looked at your posts and thought, "those boys have the cutest sweaters!" I too am of the Small Wallet and being in Houston, we just don't need many winter clothes. So I settle by drooling over yours. I need to make these promises to myself! I'm having a hard time because I don't understand how fast babies grow. They are right at the end of their stash of gift clothes and things is bought while I was pregnant so the real shopping must begin! Your boys look so cute! I love miniature man style, it totally works for your two! No doubt you learned to shop from your mom who is a great shopper. I hope all these wonderful clothes work out for you next year. It is fun to dress them up so cute! Pretty soon they won't let you.